My mother used to say that there are two things in this world that you can never have too many of…kitchen cabinets and laundry baskets. That part about laundry baskets is so true! I can never seem to find a laundry basket when I need one – and the same is true about hampers. I have hampers in every bedroom and one in the bathroom but they just don’t ever seem to be big enough. So, I thought about DIYing some laundry hampers and baskets to perhaps make them big enough to fit my needs. I found 13 great DIY laundry baskets and hampers that will make organizing laundry quick and easy. These are all so great and they are made with so many different materials. From wood to crochet and even handwoven flax, these DIY laundry baskets and hampers will definitely make doing laundry a bit easier. And if you really want to make doing laundry easier, check out these 30 brilliant ways to add storage to the laundry room. These will give you so much space for everything that you need in your laundry room. 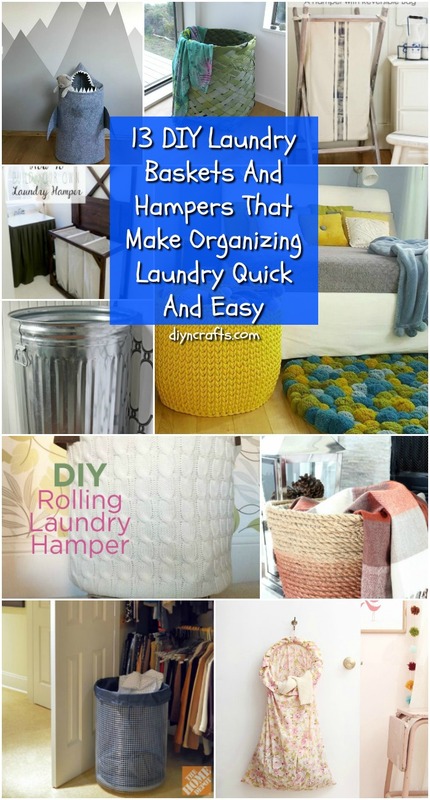 I love anything that makes doing laundry easier and these DIY laundry baskets and hampers will definitely do that. You will never have to worry about finding your laundry basket again. These are so cheap and easy to make that you can do several of them so you always have one on hand when you need it. And, speaking of laundry hacks and making life easier, have you seen this DIY laundry detergent recipe? You can make two years’ worth of homemade laundry detergent for just a fraction of the cost of buying! Take any crochet basket pattern and turn it into this gorgeous crocheted laundry basket. You will need a large basket pattern for this one and you can actually do any type of stitch that you want. This is a great way to practice new stitches, too for those of you who don’t consider themselves experts at crocheting. If you don’t want to do the work yourself, check out this really pretty one that I found on Etsy. It’s all hand crocheted and less than $90. 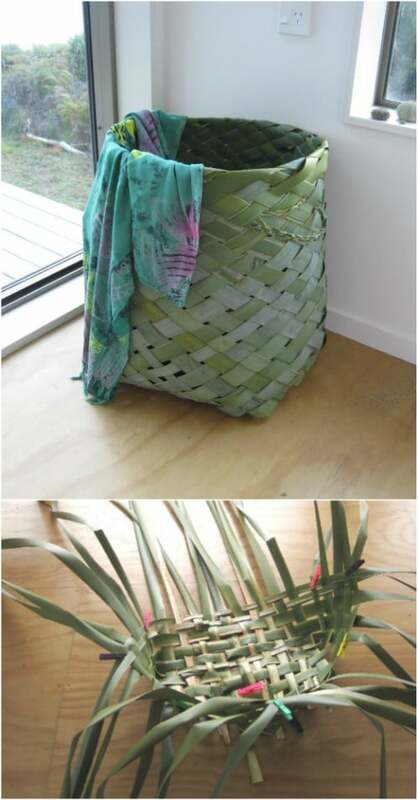 This gorgeous laundry basket is made from a pine round and some hardware cloth or thin wire. It’s a really simple project that makes a tall basket or hamper. 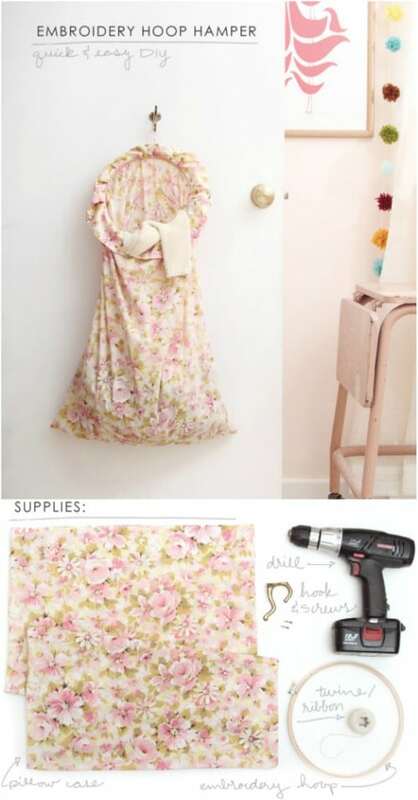 You can line it with a DIY laundry hamper liner or buy a liner at most stores that sell household products. This one doesn’t cost much to make and it’s really sturdy once you get it finished. Imagine a DIY laundry hamper that you can literally just roll to the laundry room and then back to the appropriate bedroom. 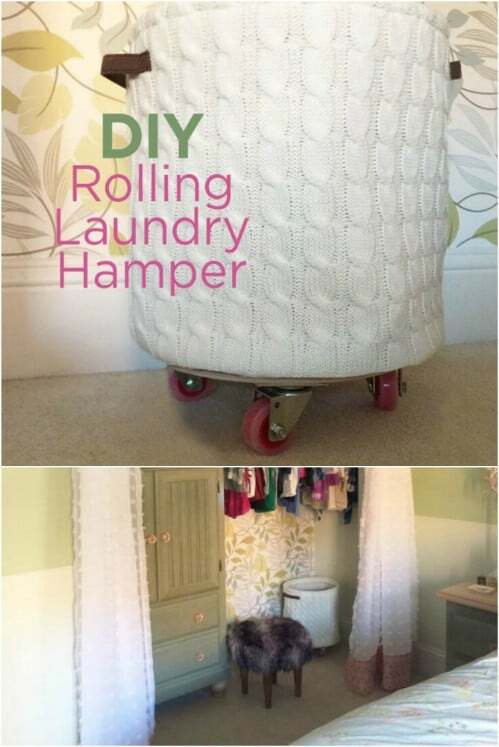 That’s what you get with this DIY rolling laundry hamper. 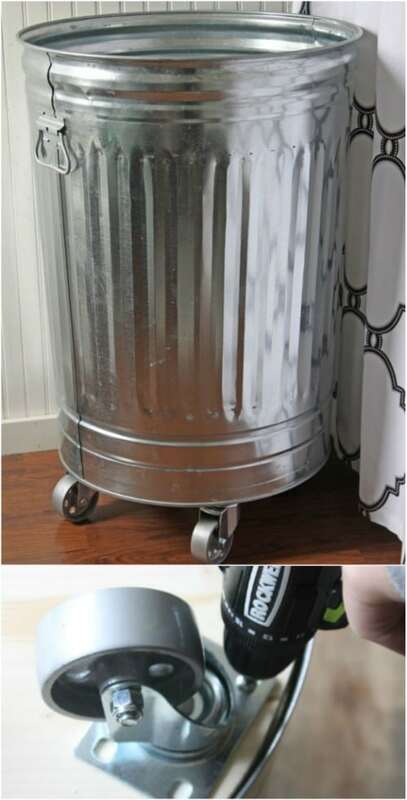 To make this one, you just attach a round laundry hamper or canvas bin to some DIY casters to make it roll. 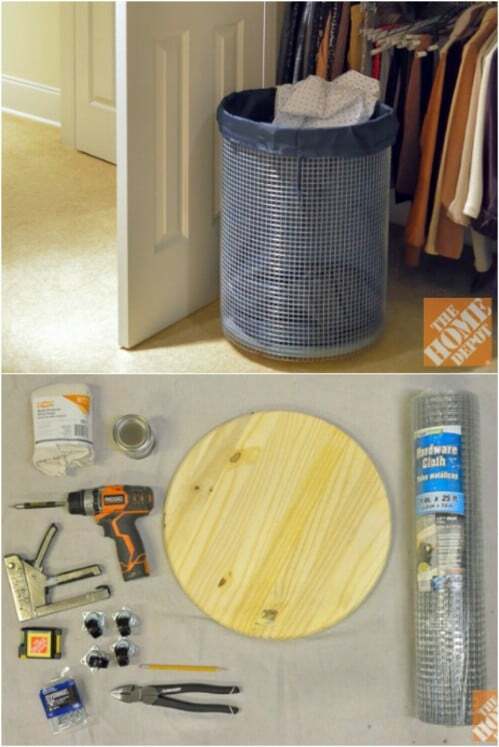 You could do this with your DIY laundry hamper if you make one or with any existing round hamper that you may already have. I love creative DIY rope projects. 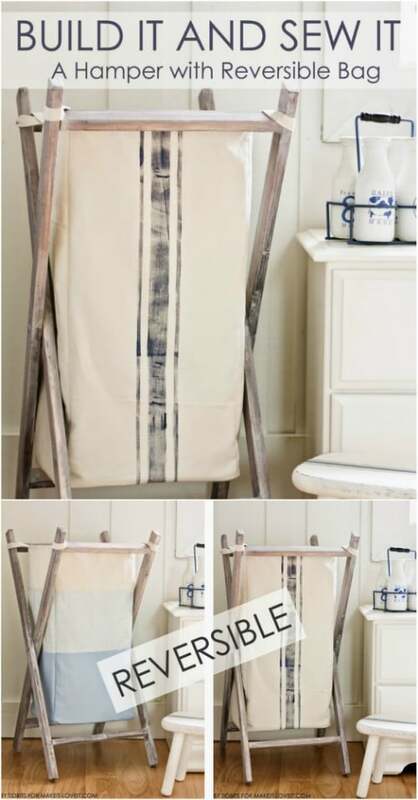 Rope has such a rustic appeal, so if you are looking for a nice rustic bedroom décor, this DIY laundry basket or hamper will fit in perfectly. You make this one by covering a cheap plastic laundry basket with rope. You can pick up a cheap laundry basket at the Dollar Store for around a dollar or check your local thrift stores. You may be able to get a couple for a dollar and then you just add the rope! I love this DIY laundry sorting hamper. Not only does it give you enough room for all of those dirty clothes, it gives you separate spaces to sort them so they are all ready for the washer when you get ready to do the laundry. This gives you an excellent opportunity to teach your little ones about laundry sorting. There are three separate bins and there’s a great hanging feature above so you can hang up those wet clothes that can’t go into the dryer. 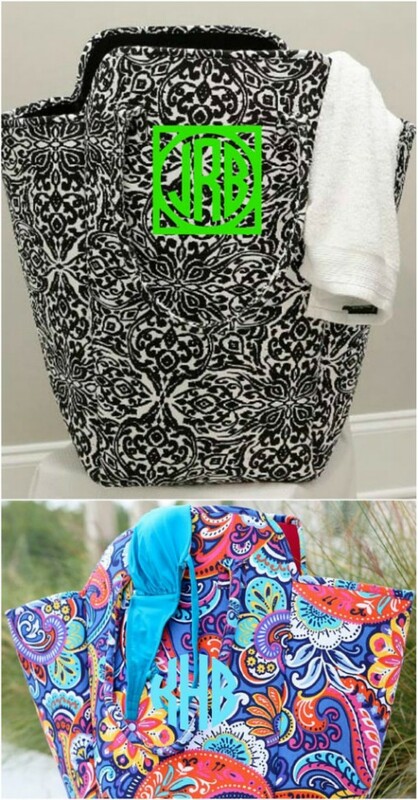 How about a hand sewn laundry hamper that has the monogram of the person that it belongs to? You never have to worry about whose hamper is whose if you have this one, and it would be really simple to make. You just create your hamper from fabric and then add the monogram with embroidery thread. Or, you can just check out this tote bag shaped one that I found on Etsy for under $50. You get your choice of four different patterns! 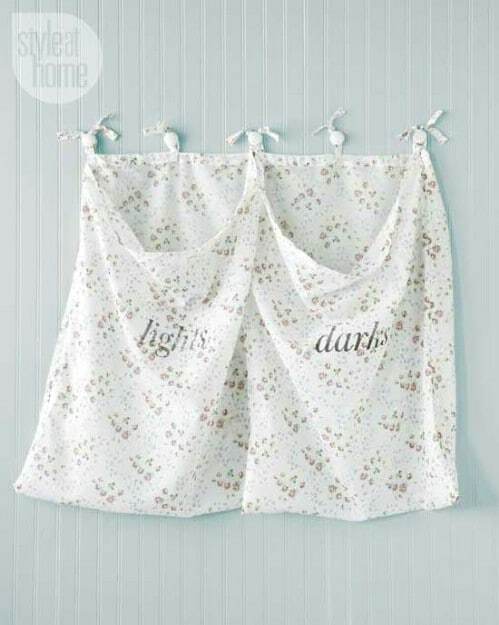 A large embroidery hoop and an old sheet or some fabric are all you need to make this great hanging laundry hamper. This could be hung on the backside of your bedroom door or inside the closet door. If you have a rather large pillowcase, you could totally use that to make this one and it wouldn’t take you longer than 15 minutes to complete. If you don’t have a big pillowcase, you can do it with fabric with just a bit of sewing required. 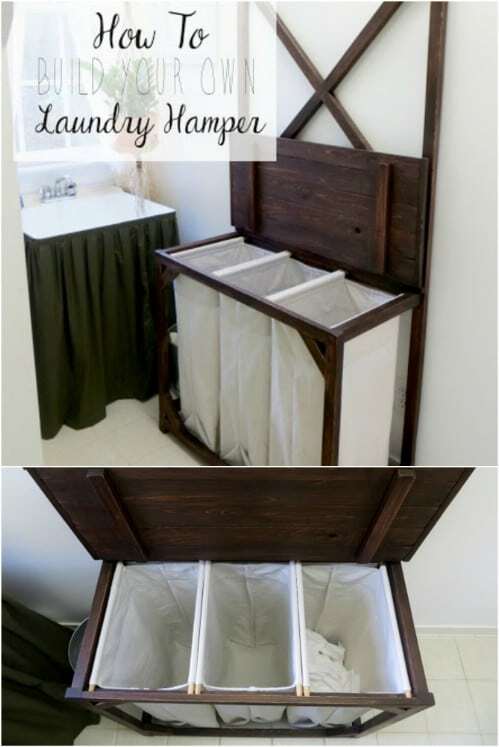 I love this DIY foldable wooden laundry hamper. Not only does it save space, it has a reversible laundry bag and such a nice rustic appearance. When it’s empty, this one stands up against the wall and doesn’t take up any space at all. But when you need it, it can hold an entire load of laundry, and it only takes a few pieces of wood to make it. You could even use reclaimed wood – I do love some creative reclaimed wood projects! Have you ever tried basket weaving? I did once and it was so much fun! You can experience that same fun, and get a neat new laundry hamper to boot with this handwoven flax laundry basket. You can actually make this out of any weavable material but how gorgeous is this flax? I love it! This one is super simple, although it is a bit time consuming. Once you get the hang of the weaving process, this one works up really quickly. You can build this gorgeous DIY wooden laundry hamper all by yourself in just a few hours. It even has a lid so that all of your laundry stays neatly hidden away. Although the building plans don’t mention it, you can also add a laundry bag to this one to make getting that dirty laundry out a bit easier. This one is perfect for a rustic look and you can even distress it when you get it build for that great farmhouse décor look. How do you make an industrial style laundry hamper? You start with a galvanized trash can. Those things even have lids so you get a great little hamper with minimal work on your part. 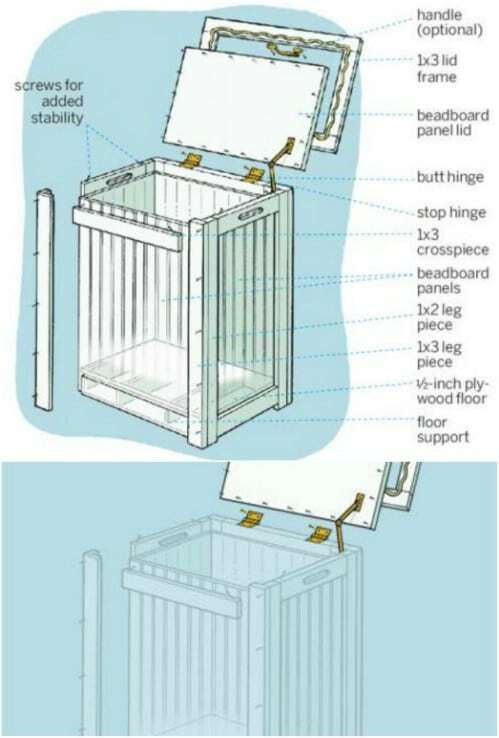 To finish off this DIY industrial style laundry hamper, you can add a DIY base with casters so you can easily roll the hamper in and out of the laundry room. 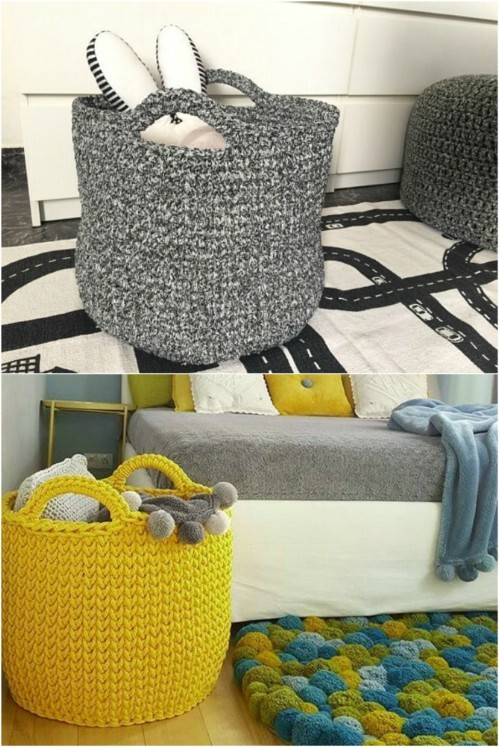 This may possible be one of the most creative DIY laundry hampers I have ever seen! I found the pattern for this DIY shark laundry hamper on Etsy. 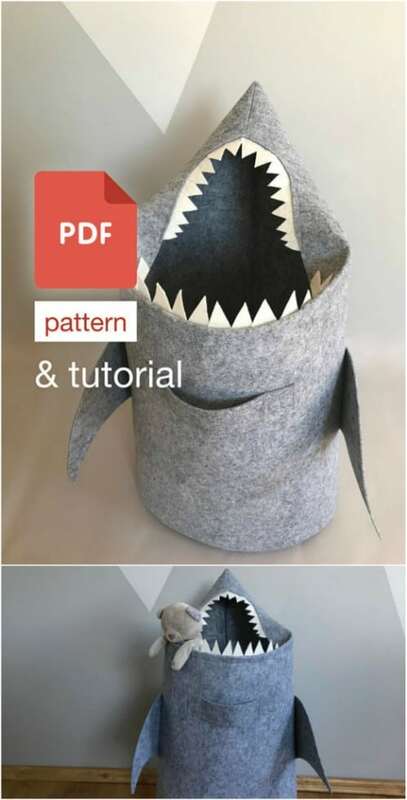 You can get the pattern for under $10 and then use it to make this adorable little shark hamper that your kids are going to love. Laundry hampers are a must for organization, and a fun hamper is a great way to organize kids’ rooms. This one is pretty easy to make once you have the pattern and you could do it in any color you want – sharks don’t necessarily have to be grey do they? Take an old draper and turn it into this amazing wall mounted laundry hamper. This would be great for kids’ rooms or you can use it in the laundry room or bathroom to keep laundry organized. It has two sections so you can even sort the laundry ahead of wash time. It’s a pretty simple DIY laundry hamper to make and since you’re using draperies, you could literally match this to any room décor. 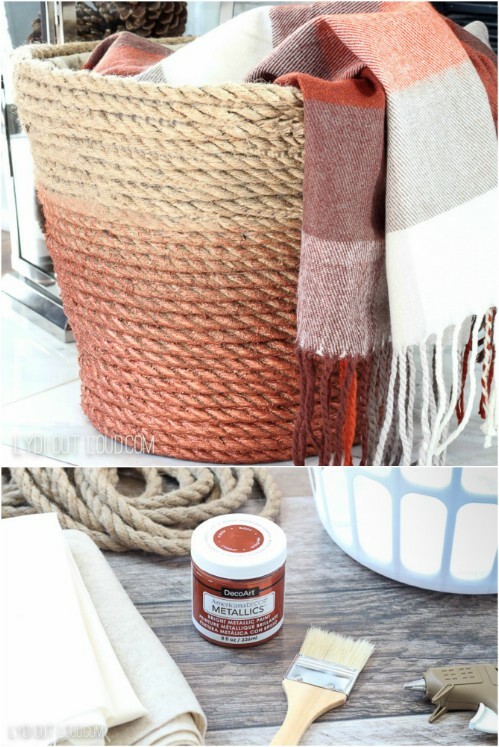 Thanks so much for including my rope basket among these fun ideas! Email and Push Notification Subscriber Settings. DIYnCrafts.com is a participant in the Amazon Services LLC Associates Program, an affiliate advertising program designed to provide a means for sites to earn advertising fees by advertising and linking to amazon.com, amazon.co.uk, amazon.ca and amazon.com.au.